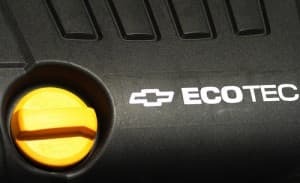 As the battle to engineer the most eco-friendly truck is waged between such contenders as Ford, GM and Dodge, GM has taken the initiative by recently releasing specifications on its all new, third generation EcoTech engine, also referred to as EcoTec3. GM has decided to completely revamp both their GMC Sierra and Chevrolet Silverado pick-ups by remodeling the exterior and giving them their new EcoTech engine. The new EcoTec3 can come as either a V6 or a V8 engine, but those looking to save in the realm of fuel expenditures would be advised to stick with the V6. The 4.3 liter V6 will has an output of 305 lb-ft of torque and 285hp. The most astounding part is its capability to tow around 7,200 pounds. This comes as great news to those who were doubtful that these new eco-friendly engines could produce a substantial amount of power. The novel engine has also helped the GMC and Chevrolet pick-ups receive a 2,108 pound payload rating. Another advantage of the EcoTec3 engine is its fuel economy. GM claims that the base models of their new pick-up trucks will have a city fuel economy of 18 miles per gallon and a highway fuel economy of 24 miles per gallon. This is good news for GM because the new Dodge Ram 1500 is also claiming the same fuel economy in the city and 25 miles per gallon on the highway. Keep in mind that these fuel economy ratings only apply to the Silverado and Sierra 4x2s. As for the 4x4s, the 2014 GM pick-ups will offer 17/22 mpg city/highway. Thankfully, the overall payload capacity and towing capacity will be the same for both the 4x2s and the 4x4s. On the mechanical side, The EcoTec3 engine is comprised of a direct fuel injection system, cylinder deactivation, and ever-adapting valve timing parts. This new generation of V6 pick-ups presents itself as a reasonable option at a time when average gas prices are steadily increasing each year and households are looking to cut down on any excessive expenditures. The new EcoTec3 engine is ingenious because it does just that. It provides exceptional gas mileage in the realm of pick-up trucks while also supplying enough power to meet most towing needs. Now GM will have to just wait and see how its new engine manages on the market against the ravishing Ram 1500 Pentastar and the formidable Ford F-150 EcoBoost.